Director Nathaniel Merrill and designer Robert O’Hearn work operatic magic in this brilliant production of Humperdinck’s cherished favorite. What Christmas is complete without this sumptuous musical retelling of the classic fairy tale, replete with guardian angels, a sandman, dew fairy, and, of course, a witch and her enticing gingerbread house. 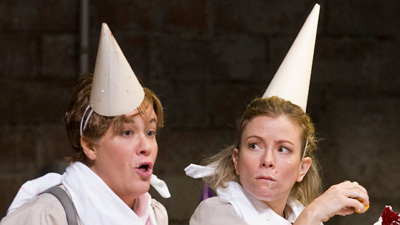 This performance, sung in English, features Frederica von Stade as the loveable but mischievous Hansel and Judith Blegen as his charming sister Gretel. Rosalind Elias is the evil Witch.